Mascot - Inspection for CofA. Clarke - solo. Mascot - Solo - Instrument test. Mascot - Instrument test & photos of drome. Mascot - Instrument and camera test. Mascot - Solo, practice, photos. Mascot - Hole cut in floor forward of pilot's seat and covered with one eighth inch Rhodoid. Solo, practice, photos. Mascot - Clarke engine test. Test Brisbane - Supplied and fitted generator field switch on cabin wall. Checked and repaired fault on cabin tank gauge. Checked electrical system for loose connections. Removed, dismantled and inspected ammeter. Removed and checked battery. Work performed by C.D. Currey, QEA Brisbane. Murwillumbah photo. Brisbane and return to despatch photos. Brisbane and return to pick up prints. Murwillumbah. Brisbane and return with film. Nimbin. Brisbane and return to deliver film and pick up prints. Kyogle - drop prints. (Major Clewes of the Army Survey Corps was stationed at Kyogle). Brisbane for overhaul of gyro and deliver film and pick up prints. Nimbin - Photo. Brisbane and return to despatch film. 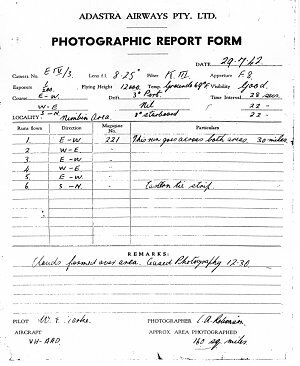 (See Photographic Report Form above). Nimbin. Brisbane and return to despatch film. Compass swung by QEA at Archerfield. No photography possible 30OCT42 to 08NOV42 owing to unsuitable weather. No photography possible30OCT42 to 08NOV42 owing to unsuitable weather. Kempsey - Coffs Harbour - Mascot. (Unable take-off Kempsey with full fuel load). Coolangatta - Mascot. Pilot N. Rodoni had informed Adastra that he could no longer carry on with flying at high altitude owing to trouble with his eyes. Rodoni returned to Mascot with the Waco and subsequently joined the DCA. Follett was attempting to secure the services of an air survey pilot currently employed by ANA. Mascot - Picton - Mascot. Photographic training flight. Note: These flights are extracted from the contents of NAA MP203/1 165/102/96. They are not a comprehensive listing of all flights in connection with this contract, just those specifically mentioned in correspondence in this file.